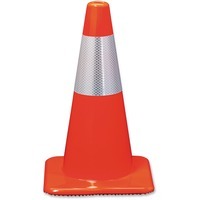 Reflective safety cones are constructed of extra heavy PVC. They are great for traffic safety and control, construction sites, hazard marking and a variety of other applications. A single sleeve of 3M reflective material is applied to this cone for 360 degree visibility. Day glow orange color ensures high visibility. Durable construction allows use in various weather conditions.